I’m back, and home again. Went Truck shopping for Dad’s birthday. He’s been at this since early this Spring. I’m sooo, glad this is over. We went all the way up to Green Bay, and then ended in Appleton Wisconsin to find just the right (RED) Truck. Anyway, I picked up three new punches along the way but haven’t been home long enough to try them until now. 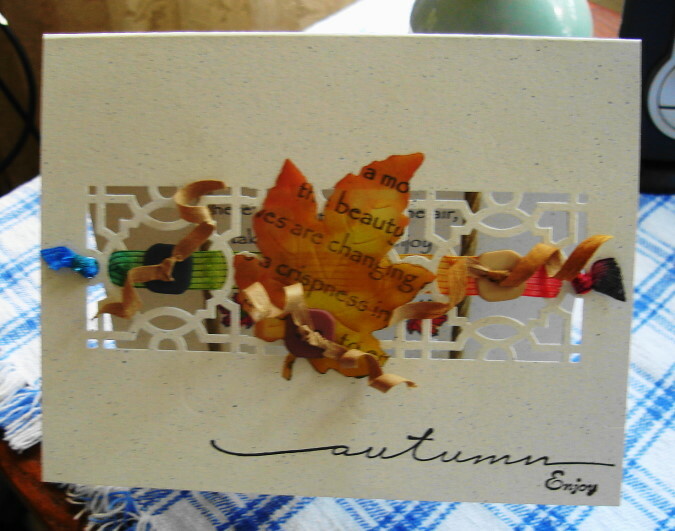 So Today I’m posting two punched fall cards. Hope you enjoy them. This is the large (All Over The Page) punch from Martha Stewart. 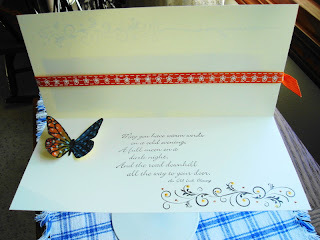 My stamps are from Hero Arts and the inside (phase) is from DRS and butterfly is from TAC. Second card, punched with an (All over the page) punch. But this time I did a lot of measuring to get this to fall right in the middle of the card. But it was sooo, very worth the extra work. The large leaf is Marvy punch and punch on vellum and inked with distress inks, and stamped with Memento’s ink Inside shows the ribbon through the punched work. My stamps are (front) Hero Arts and Stampin’ Up, inside is DRS and Michael’s dollar stamp. 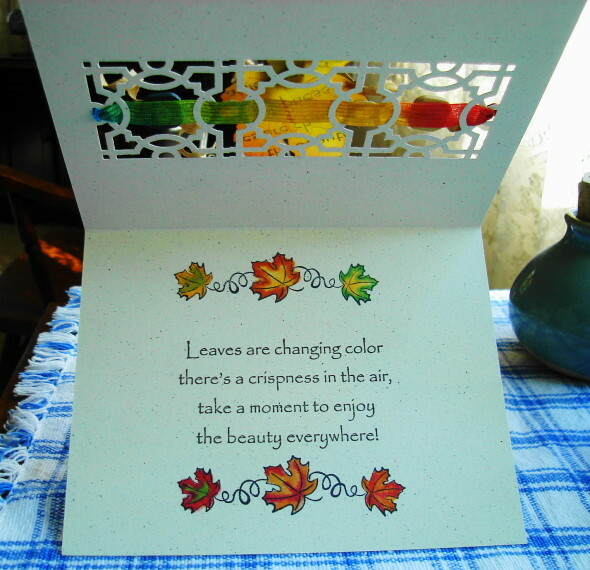 Hope you enjoy them, have a wonderful Fall Day. Gorgeous cards! Love the punch out in the center of the page! I clicked on each picture to see more detail! Vada, these are both incredible! You even weaved the ribbon into that punched design! Beautiful stamped Fall cards! So were is the picture of your Dad's red truck? Hugs my friend! Totally delightful....and beautiful as always, Vada! Wow, these are beautiful. I really love the butterfly one especially how you placed the top panel up/over the ribbon and then had additional stamping below. It's a very pretty and unusual look. The cards you created are stunning!! The most gorgeous colours you used and very beautiful indeed.